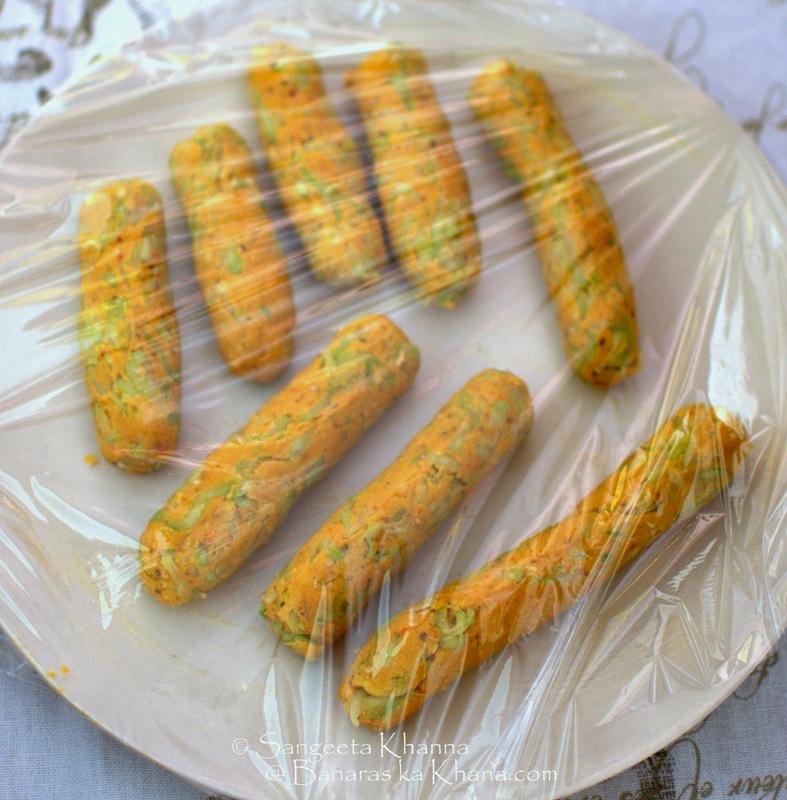 Muthia is a steamed dumpling made with grated vegetables and chickpea flour which is made into a dough and then rolled into sausage shaped 'muthia' before placing them on the steamer. The traditional muthia is made by pressing a portion of dough inside the fist (muthhi) hence the name muthia. It is a Gujrati tradition but popular all over India in some or the other form. Muthias get steamed quickly and can be cut into small pieces and served along with some green chutney. 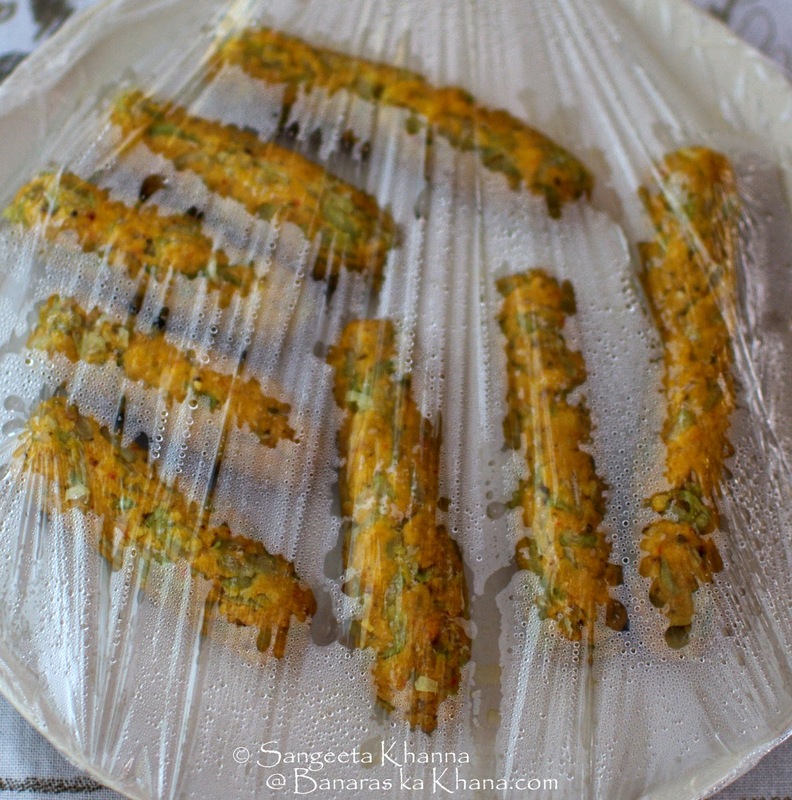 Or the cut pieces of muthia can be shallow fried along with some tempering to be served as a tea time snack. 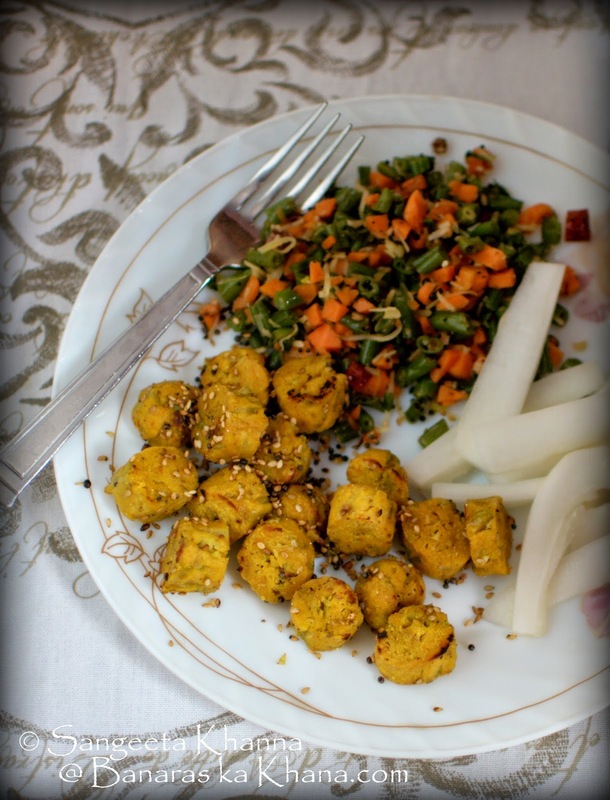 Lauki ki muthia is an easy way to make the meals filling and nourishing. 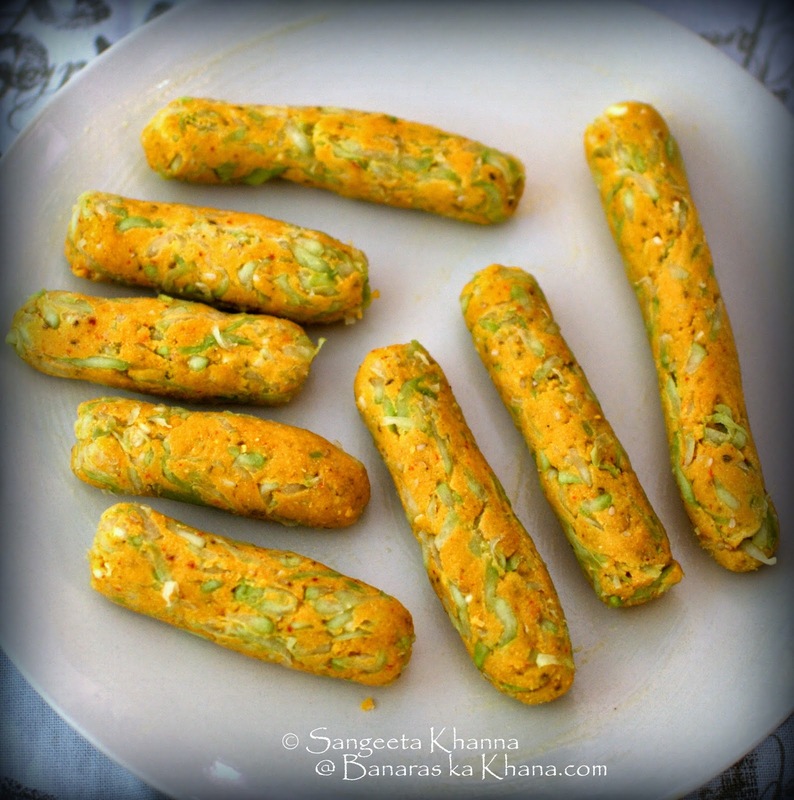 Since we use besan (chickpea flour) to bind the muthias it makes a gluten free meal too. Please note that the recipe is easy and takes just about 20 minutes if you are making muthias for 3-4 people. 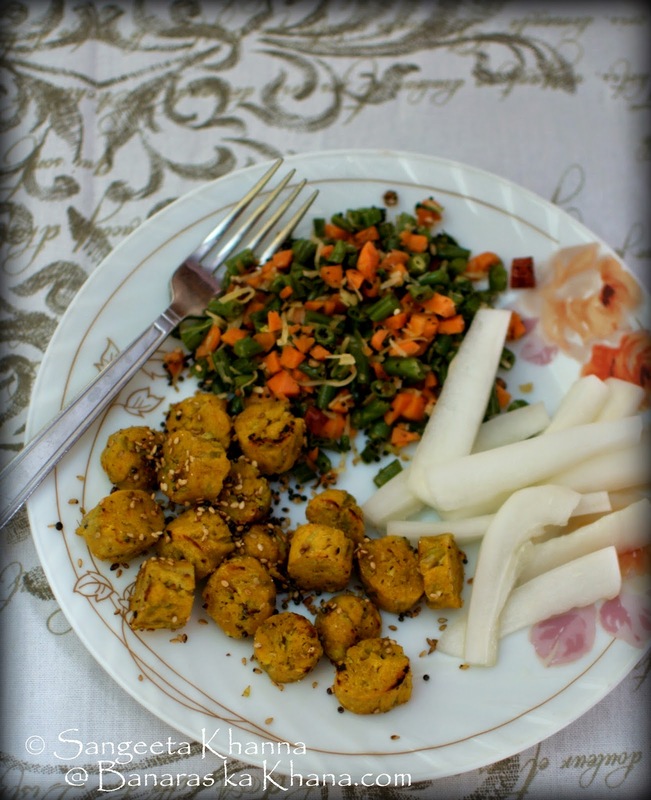 And these steamed muthias can be refrigerated and used later to make tea time snacks or even kofta curries. If you get the lauki (bottle gourd) grated in a food processor or get it done by the maid (we are spoiled in India :-)), the procedure will be even more quick. Mix all the dry ingredients with the grated lauki and massage them together so the water from lauki helps make it a dough. You might need to add a little more besan or little more lauki depending on how fresh and tender the lauki is. I recommend the freshest lauki you can find. See how to choose the right tender bottle gourd. Now grease a ceramic or pyrex dish and your hands too. Pinch portions of the dough and shape them like 2 cm thick sausages or press portion in your fist to shape them like traditional muthias. Arrange all such sausages (or muthias) on the greased dish. Now cover the dish with cling wrap loosely. Leaving some space for the steam to escape. Make cuts in the cling wrap otherwise. You can cover the plate with a dome shaped plastic lid meant for microwave and steam it for 5 minutes too. With the cling wrap too it takes the same time. The muthias get cooked as steam condenses on the cling wrap. Peel off the cling wrap and use the muthias as required. These can be enjoyed right away with green chutney or with any sauce or salsa you like. These can be steamed over the gas stove too. See this post about another steamed dumplings to get an idea how a simple contraption can be used to steam these. Once cooled, the muthias get firm and can be shallow fried along with mustard seeds, hing and some sesame seeds for crunch. Sprinkle some amchoor powder or lime juice and have these with some warm salad for a meal. Here I served it with a beans and carrot poriyal and pickled cucumbers. We sometimes use these muthias to make kofta style curries too. Just deep fry or shallow fry these muthias and curry them with a north Indian style bhuna masala. I normally shallow fry these muthias cut into one inch long pieces, and pressure cook them along with some bhuna masala and water. Add enough water to the muthia as they soak up a lot of water and double in size when cooked into a curry. Refrigerated (2-3 day old) muthias behave well in pressure cooker as they get firm and do not break. You can cook this curry in an open pan if using freshly made muthias. 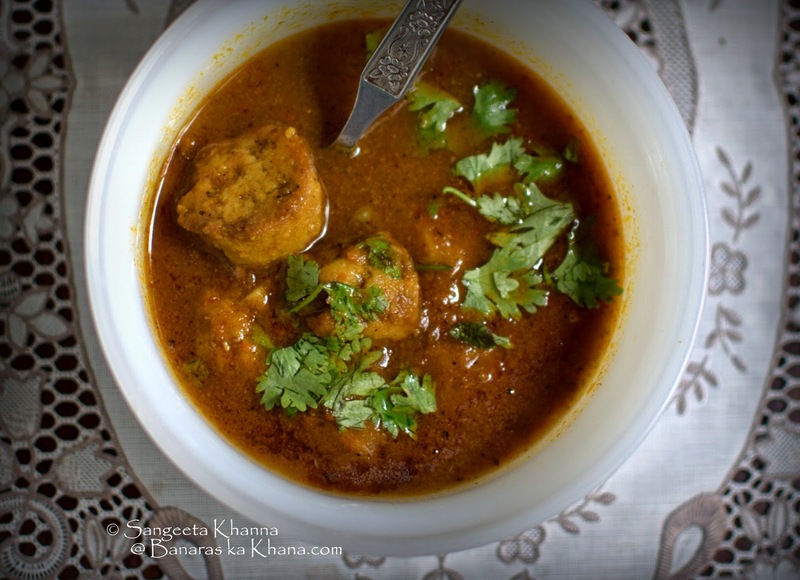 This lauki muthia kofta curry tastes great with roti, paratha or plain boiled rice but you can always make the curry light and thin and have it as a one pot meal as I do sometimes. We love this kind of kofta curries better than the fried round koftas (like this kele ka kofta). This muthia kind of kofta works better for lauki and is healthier as well. I don't remember if I have cooked a traditional lauki ka kofta ever in my life. But I love besan dumpling curries so this lauki muthia kofta style curry is one of the favourites. The taste and texture is quite different and so is the health quotient of this curry. Let me know whenever you try making muthias this way in the microwave. It will be the easiest healthy snack to munch on and some spicy curry can be whipped up in a jiffy. 2. I use coarsely ground wheat flour and besan in equal proportions. 3. You can cook them in the appe patra, this way you get the kofte for the curry. BTW I am a regular visitor to your blog, and love it.